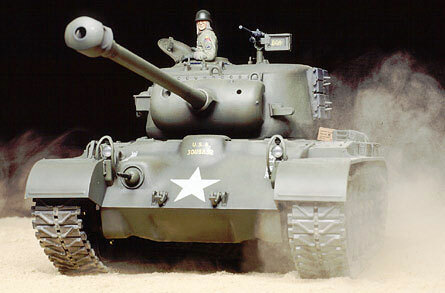 Tamiya U.S. M26 Pershing T26E3 - Full Option RC Tank Model Kit. These 1/16 scale models can be equipped with IR battle systems. Then you can set up mock battles with 2 or more tanks and have your own tank battles in the comfort of your backyard. Special Order Item. Tamiya compatible 7.2V battery and charger.